This application shows how to configure a web-based POS system including mobile POS system. Adding mobile terminal and printer makes the operation of a speciality shop more flexible. The Web server on the Internet provides the back office application for each shop, including on-time goods inventory report and so on. A mobile device, e.g. tablet PC, and a mobile printer will compose the mobile POS. 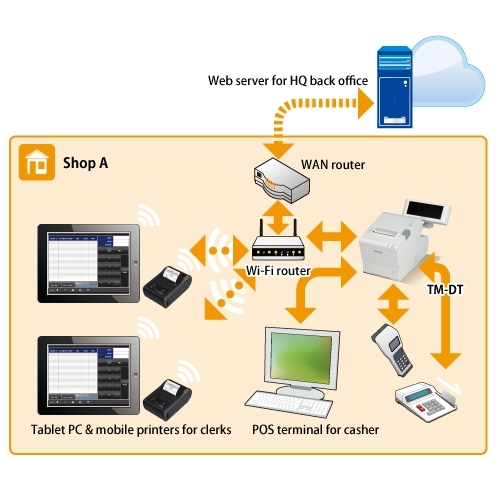 In case of Web based POS application, the mobile printer has to connect to the tablet PC through Wi-Fi interface. Using mobile POS system, the clerk can check out the sales for a guest everywhere at the shop. Using the mobile device, the clerk can show varieties of back office data, e.g. online goods inventory data, to the guest every time the guest wants.